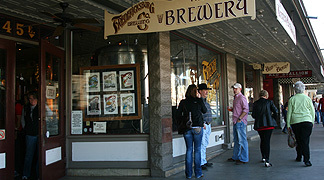 If you're in the hill country and would like to explorer a quaint town - Fredericksburg is the place to go. It is located seventy miles west of Austin in the county seat of Gillespie County. The ride from Austin allows you to continue viewing the scenic Texas Hill Country. You pass through Johnson City where the LBJ National Historic Park is located, Stonewall where Lyndon B. Johnson was born and the site of LBJ Historic Park, and Luckenbach is just a short drive off highway 290 right outside of Fredericksburg. Fredericksburg was originally a German settlement that began in the 1840's. The town was named after Prince Frederick of Prussia. The town began with 120 settlers and now according to the Census Bureau, the populations is 11,305. One of the Organizations that devoted many hours to help make Fredericksburg an important tourist center is the Gillespie County Historical Society. Because of this group's hard work there are at least three informative historical sites all tourist must see when visiting Fredericksburg - the Pioneer Museum complex, the Admiral Nimitz Museum in conjunction with the National museum of the Pacific War, and the Vereins-Kirche Museum. 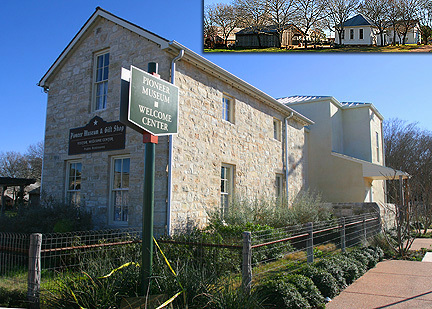 The Pioneer Museum provides a look back at German heritage in Texas during the pioneer days. Artifacts of furniture, tools, farm equipment, kitchen items, as well as art and photographs are displayed. The whole complex 3.5 acres with flowers dispersed throughout the area making it a beautiful natural setting to daydream about life of a pioneer. The Admiral Nimitz Museum is located in the Nimitz Hotel, a museum that is dedicated to Chester Nimitz, an Admiral and hero during WWll. He was born in Fredericksburg in 1885, grew up in the Nimitz Hotel that his family owned. Within the the past 10-15 years, the National Museum of the Pacific War was added on to the Nimitz Museum. Within the museum you can view live depictions and listen to stories of the Pasific Theater battles of World War ll. There are life-size replicas of Allied and Japanese aircrafts, campsites, tanks, and guns. The Veriens-Kirche Museum houses historical exhibits. The building is a replica of the first church, called the "Society's Church". Inside this landmark you can learn about the history of the church. 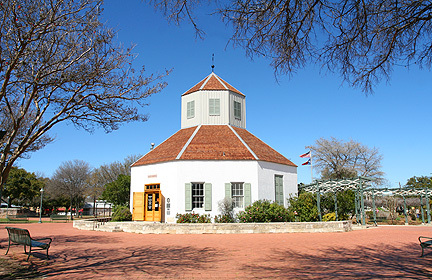 This octagonal structure is located at Market Square - or Marktplaz - which has been at the center of Fredericksburg since the city's founding in 1846. Not only does this town have a rich heritage, it has become a town full of variety of shops that entertain the eye and restaurants that full fill the taste buds. You can spend an entire day just browsing through antique shops, craft stores, art galleries, gift shops, clothing stores, and variety stores mostly along Main Street. Adults may like to experience wine tasting, envision a new living room while browsing through several interior decorating and furniture galleries, and of course sit back and enjoy live music at various places. The children can enjoy the playground at the Marktplatz, and of course indulge in the "sweet" shops. Clear River Pecan Company may sound like a shop that sells items made with pecans. On the contrary, it is a nostalgic ice cream parlor, bakery, and café. Once you walk in you feel like you stepped back in time during the 1950's with a jukebox, bubblegum machine, red booths, and Elvis serving ice cream. They have an assortment of pastries, pies and sweets. But do not leave without trying some award winning ice cream. Since Fredericksburg is a German-influenced area, of course you will find several biergartens to experience the German culture and food with German flare. If German food does not suit you, then you have every other type of food to choose from. There is Tex-Mex, barbecue, Italian, and an assortment of bistros and café type dining. 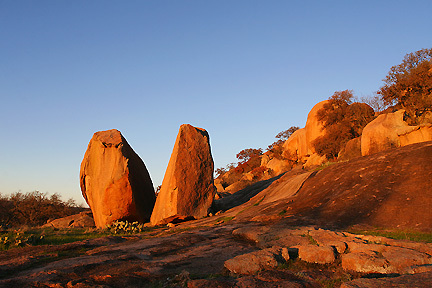 For those that desire more recreation, you have to experience Enchanted Rock State Natural Area. The attraction is a 425 feet high granite exfoliation dome and covers 640 acres. This is a Texas State park that allows camping, hiking, and picnicking. The interesting aspect is seeing grasses and trees that have somehow grown in the rock-bottom pits throughout the huge rock structure. When you get to the top it is a stunning view of the Texas Hill Country. Of course, there is also all the natural Areas and State Parks to hike and explore. 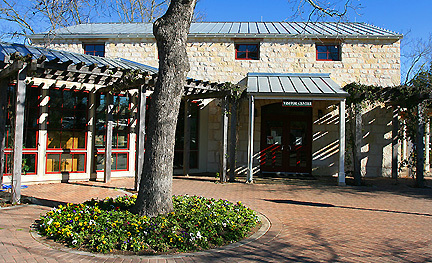 Fredericksburg Nature Center is situated inside the boundaries of the Lady Bird Johnson Municipal Park, the Fredericksburg Nature Center offers a scenic and diverse blend of Texas Hill Country habitats. Flora and fauna surveys indicate more than 250 flowering plants, 160 birds, 60 butterflies, and 45 dragonflies and damselflies. A 650 foot long handicap accessible trail allows users to enjoy the essence of the nature area. The nature center features over 6000 feet of trails that wind through the scenic and diverse habitats. Facilities at Lady Bird Johnson Municipal Park include: campgrounds with RV hookups, picnic areas and covered pavilions, Olympic-size swimming pool, lighted tennis courts, municipal golf course, fishing and non-motorized boating. Something you don't get to do very often is pick your own lavender, Hummingbird Farms, and the Miller Creek Lavender Farm in nearby Johnson City. They both have beautiful countryside and areas for for a nice picnic. 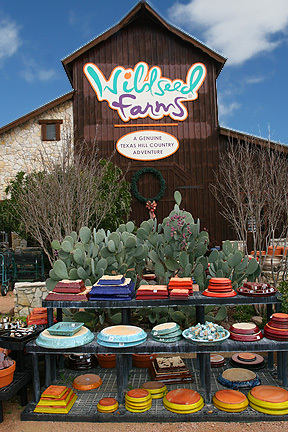 If you desire even more beautiful scenery and love flowers and plants, then the Wildseed Farms and the Fredericksburg Herb Farm are exciting places to visit. The Wildseed Farms not only offers information about plants, but you can purchase a variety of items, sit at Brewbonnet Biergarten for a relaxing place to have a drink or eat, or visit the Butterfly Haus. It is fun to have all kinds of butterflies land on you or watch them fly in a flowery setting. The Fredericksburg Herb farm offers a more tranquil atmosphere with a restaurant, bed and breakfast, and spa. Throughout Fredericksburg there are many bed and breakfast establishments, guesthouses, country inns, hotels, and ranch houses to make your stay even more special. Dedicated to all those who served in the Pacific War. The Admiral Nimitz Museum, George Bush Gallery of the Pacific War, the Plaza of the Presidents, Japanese Garden of Peace, Memorial Walk, and the Pacific Combat Zone are all part of the complex. See displays of Borne of the most notable aspects and events of WWII in the Pacific. Hours: 9AM to 5PM. Open daily except Thanksgiving, Christmas Eve and Christmas Day. Experience the rich German heritage of Gillespie County. This 35-acre museum complex contains superb examples of early German structures and artifacts. Located in Burnet County, 9 miles west of Burnet off Texas 29, on Park Road 4, 512-793-2223 - Park camping, RVs, shelters, picnicking 7.5 miles of hiking trails, boating, water skiing, fishing, swimming, golf, watchable wildlife facilities for handicapped, store. Located in Bandera County, five miles north of Vanderpool on Ranch Rood 187, 830-966-3413 Park camping, RVs ( water & electric ) picnicking, 10 miles of hiking & nature trails, historical site/structure, watchable wildlife, fishing, swimming, interpretive exhibits/museum, store. Located in Gillespie County on Hwy. 290, between Johnson City and Fredericksburg (830) 644-7752, Park historical site/structure, picnicking, fishing, swimming, nature/historical trail, interpretive exhibits/museum, watchable wildlife, Store. located in Blanco County, nine miles east of Johnson City on FM 2766, 830-868-7304, Park camping, RVs, picnicking, fishing, swimming, 8 miles of developed hiking trails additional primitive trail system), mountain biking, horseback riding, nature trail, watchable wildlife, store. Located 10.5 miles south of Hwy 290 on the Old San Antonio Road, 866-978-2287, Millions of Mexican free-tail bats make their summer home in Central Texas. View the evening emergence of bats during the season which normally runs mid-May to Mid-October. The upper viewing deck is open nightly at no charge. Visit the Museum of Western Art, the YO Ranch, the headquarters of James Avery Craftsman and art galleries in the Kerrville area, and then head to Medina to check out the local apple crop. Bandera, the Cowboy Capital of We World, whew horseback riding and boot-scootin to country western music are the order of the day, and night, is just down the road. Take Highway 87 north to Mason, home to historic Fort Mason, the 1928 Odeon Theatre and Sandstone Cellars Winery. Blue Topaz, the state gem, is found only in Mason County. Head east to Llano, known for its historic courthouse, barbecue restaurants, deer hunting and the Llano River. From Llano it is a short dive to impressive Lake Buchanan, covering over 23,000 acres. A thriving colony of bald eagles lives on the upper reaches of the lakeshore during the winter months. Arid don't miss Fall Creek Vineyard while in the area. 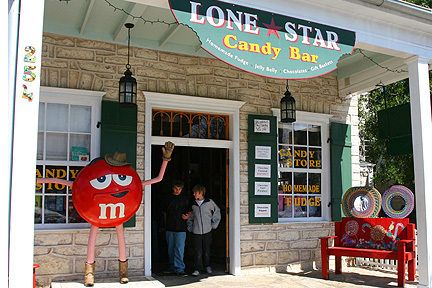 Head east on Highway 290 and take in small town life in Stonewall, as well as the LBJ Ranch. Stonewall is famous for its peach crops and the Peach JAMboree in June each year. In Johnson City, stop at the Visitor's Center for the LBJ National Historical Park and check out the Exotic Zoo, and Texas Hills Vineyard. In Blanco, park near the lovely old courthouse on the town square and check out the shops. Blanco State Park offers opportunities for picnics, fishing, swimming and tubing. Return from Blanco to Fredericksburg via FM Road 1623 for a scenic drive. The back roads of Gillespie County provide miles of scenic views for road bicycle riding. Although the area roads are lightly traveled compared to big cities, riders are encouraged to obey all rules of the road to ensure their safety. With the hilly terrain, autos can come upon bicyclist without much notice, so please stay as far to the right as possible. Mountain biking enthusiast will enjoy Hill Country State Natural Area, near Bandera and Pedernales Falls State Park, near Johnson City. Approximately 300 species of birds occur in the Texas Hill Country, where birding is great all year. The area is an overlap zone of ranges of eastern and western bird species, as well as some north and south species. Be sure to look for the endangered Black-cupped Vireos and Golden-cheeked Warblers. 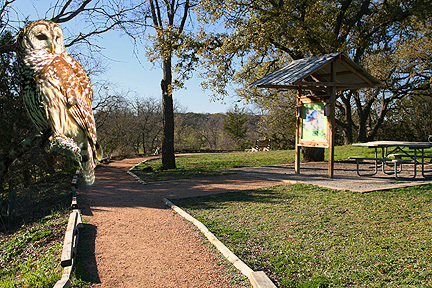 An excellent place to view birds in Fredericksburg proper is the live Oak Wilderness Nature Trail in Lady Bird Johnson Municipal Park. Stop for a bird check-list at the park office Pedernales Fills State Park, near Johnson City, has wildlife viewing stations, while Enchanted Rock State Natural Area, 18 miles north of Fredericksburg, is also a premier bird-watching location. The closest place for kids to drop a line in the water is Lady Bird Johnson Muniapal Park on I highway 16 South. With prior arrangement, Hill Country Outfitters, 109 Cast Main, will plan fly fishing lessons and/or expeditions for groups - The Country Flyfisher, 830-990-9453, can also help find places to fish around the area See city and state parks.